The Receiver for CONNEX Mini from Amimon is the Ground Unit component of the CONNEX Mini video downlink system. 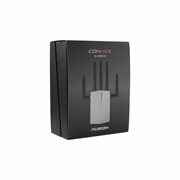 The CONNEX Mini features the same 1080p60, zero-latency performance as the standard CONNEX, but in a scaled-down form factor and with a line-of-sight range of 1600'. The lighter weight system is ideal for smaller UAS, such as those carrying action cameras like a GoPro or compact mirrorless cameras like the Panasonic GH4.